Currently Obsessed. 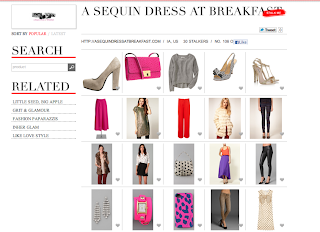 For those of you who have not heard of this website, it's every on-line shopper and blog stalkers dream. (Yes there is a "stalk me" icon for bloggers who's fashion you love). All you have to do is sign up, and from there you can follow the bloggers who you adore. What this site does is takes items that are in stores and on-line now that people are looking at and brings them a click away. You know we ALL do it, that shirt that you love and you keep returning to on-line (maybe keep in your on-line shopping basket for a week or two). Well here is the place where you can keep track of all the items you are "stalking" and get more ideas for items you would like to stalk, or maybe even buy. I have submitted my blogging request to become a blogger who you all can stalk, so fingers crossed, if that happens I will let you guys know! In the meantime, there are a ton of great blogs on their now so I encourage you to look. Happy stalking!